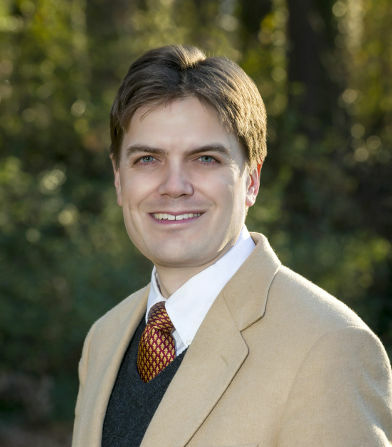 Director of the Mood Treatment Center and instructor at the Wake Forest University School of Medicine. Co-author, with Jim Phelps, of Bipolar, Not So Much (W. W. Norton & Company). Bipolar disorder has long been controversial in the field. Is it overdiagnosed or underdiagnosed? Does a “bipolar spectrum” truly exist, or is it a marketing tool for pharmaceutical companies that want you to prescribe more atypical antipsychotics? At a minimum, the bipolar spectrum includes those patients who meet criteria for both bipolar I and II disorder, which accounts for roughly 16% of depressed patients. But DSM-5 changed that percentage drastically to include two new conditions on the spectrum: antidepressant-induced mania/hypomania and depression with mixed features. Adding in these patients, the prevalence of bipolar spectrum among depressed patients skyrockets to 41%. Moreover, it rises to 47% when we include depressed patients with short-duration hypomania (a condition in the appendix of DSM-5). Those figures are estimates derived from two international studies with a total N of over 8,000 patients, and they are consistent with other estimates that place the bipolar spectrum at 40%–50% of depressed patients (Nusslock R and Frank E, Bipolar Disord 2011;13(7–8):587–603). These figures may sound preposterously high to some clinicians, but to be clear, being on the bipolar spectrum is not the same as having “bipolar disorder.” Instead, it reflects the growing realization that mood disorders should not be split into arbitrary categories. Indeed, David Kupfer, the DSM-5 chair, wrote that depression and bipolar are part of “a continuum, with variable expressions of vulnerability to hypomania or mania” (Phillips ML and Kupfer DJ, Lancet 2013;11(381):1663–1671). Clinically, what does all this mean? As a specialist in bipolar disorder, I am convinced that many more patients fit on the bipolar spectrum than we realize. In this article, I will describe five common types of patients who may not appear “bipolar” at first glance but who likely fall somewhere on the spectrum. If you can learn to recognize these patients, you will likely be able to fine-tune your treatment approach and have more therapeutic success. The “mixed features specifier” in DSM-5 applies to unipolar and bipolar patients who have 3 or more manic symptoms during their depression. What does this mean? Patients with a history of unipolar depression and without a history of manic or hypomanic episodes do not qualify as bipolar disorder. However, many of these people will present with depressive episodes that include some manic symptoms. 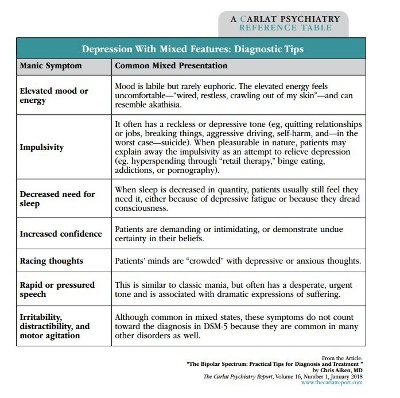 These are called “depressive mixed states.” Does this mean such patients are on the bipolar spectrum? In my view, it does, because you will treat them differently from patients who present with a standard depressive episode. According to a meta-analysis involving 20,000 patients (Vázquez GH et al, J Affect Disord 2018;225:756–760), a significant minority of unipolar patients (25%) have depression with mixed features. Because they don’t look like the manic symptoms that we are used to seeing, these mixed-manic symptoms can easily be missed. For example, when we think of elevated energy in bipolar disorder, we often think of increased productivity. But when mixed with depression, this energy leads to directionless, disorganized activity. Similarly, rather than experiencing an exciting flight of ideas, patients with mixed features have uncomfortable racing thoughts—usually depressive and anxious thoughts—that they desperately want to turn off. Recently, guidelines have been published for the treatment of depression with mixed features (Stahl SM et al, CNS Spectr 2017;22(2):203–219). Because essentially all the authors of these guidelines have financial relationships with pharmaceutical companies, we should take these recommendations with a grain of skepticism. Nonetheless, the article presents a good overview of the current research in the field, and the treatment recommendations are not unreasonable. 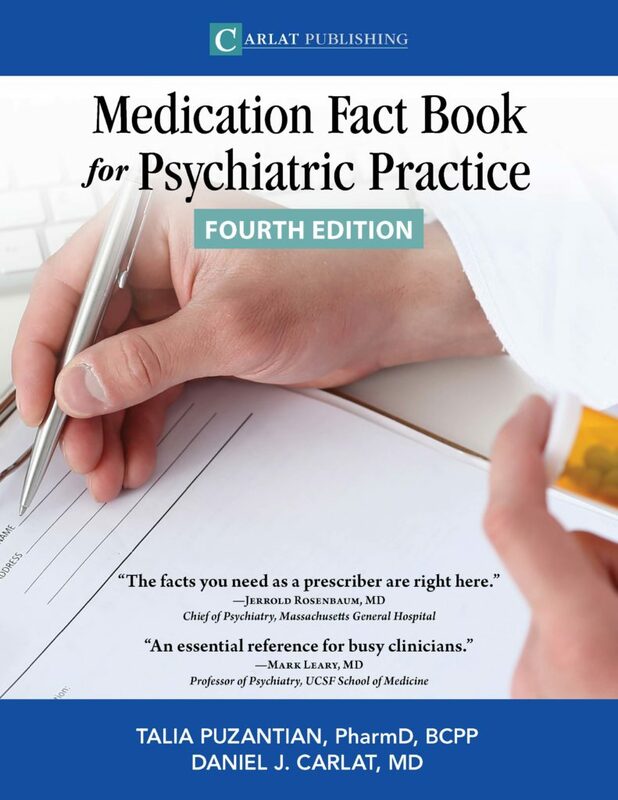 The authors recommend atypical antipsychotics as first-line treatments (specifically aripiprazole, asenapine, lurasidone, quetiapine, and ziprasidone). Second-line antipsychotics include cariprazine and olanzapine/fluoxetine combination (ie, Symbyax). 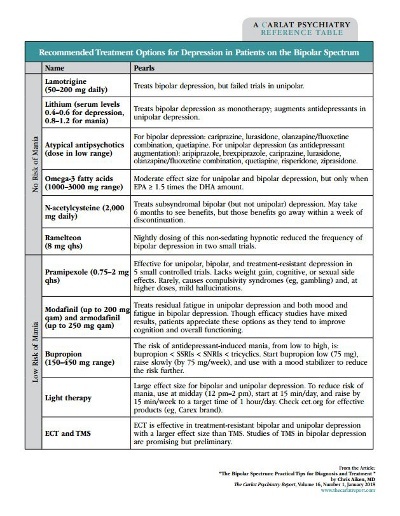 Traditional mood stabilizers (lithium and the anticonvulsants) are second-line, and antidepressants are relegated to third-line therapies (even in unipolar patients with mixed depression) and only recommended in conjunction with mood stabilizers. In actual practice, most patients are already on an antidepressant when their mixed features are discovered. The first step in such cases is to determine if the antidepressant is clearly helping the depression or contributing to the manic symptoms. If the antidepressant is helping, my policy is to leave it be and to monitor the patient closely. But if the antidepressant is aggravating manic symptoms, such as racing thoughts and insomnia, I will taper quickly over 1–2 weeks. Sometimes the antidepressant is simply ineffective, in which case I will usually taper it off, but more slowly (over 1–2 months). In terms of antipsychotics, I am not nearly as enthusiastic about their use as the authors of the mixed depression guidelines. Although I acknowledge that some atypicals are “cleaner” than others in terms of side effects, I am concerned about the long-term risks of metabolic syndrome and tardive dyskinesia (the 1-year incidence of tardive dyskinesia on atypicals is estimated at 7%). Because of these concerns, I usually reserve atypicals for acute episodes and use traditional mood stabilizers, particularly lithium and lamotrigine, for long-term prevention. Lamotrigine is free of long-term risks; lithium, on the other hand, can cause a variety of problems such as hypothyroidism, weight gain, and (rarely) renal insufficiency. But with close monitoring, such problems can be minimized, and lithium has the extra added benefit of a clear antisuicide effect. Psychotherapy should be considered for all cases of mixed depression. For all patients, whether in therapy or not, I emphasize a few lifestyle changes to help stabilize manic symptoms. Foremost is developing regular routines around sleep and waking. In the morning, patients should rise briskly out of bed (a dawn simulator can help) and start their day with an engaging activity. The evening routine should conjure sleep, with a relaxing activity, low lights, and an “electronics-free zone” in the half-hour before bed. Dark therapy, in which patients wear a $10 pair of blue-light filtering glasses in the evening and sleep in pitch darkness, is a new technique for mania that has shown promise in a small controlled trial of hospitalized patients. Around 40% of patients with bipolar II disorder have an underlying cyclothymic temperament. These patients have a stormier course than their classic bipolar II counterparts, who have productive, euphoric hypomanias and long periods of stable mood. In contrast, cyclothymic mood swings start early in life and are woven into patients’ temperament, allowing little time for a stable identity to develop. Euphoria is rare in these patients, and mixed states are common, with all the despairing, paradoxical symptoms described in the Diagnostic Tips table on page 2. These patients have high rates of comorbidities, particularly borderline personality disorder, addictions, anxiety disorders, PTSD, OCD, ADHD, and eating disorders. Detecting bipolar symptoms amidst all these comorbidities is difficult, so the Bipolarity Index is particularly useful in this group; in one study, it outperformed other screening tools at distinguishing bipolar disorder from pure forms of Cluster B personality disorders. (Ed note: For more information on the Bipolarity Index, see this issue’s QA interview with Dr. Aiken). Psychotherapy should be part of the treatment for this group. Dialectical behavior therapy is often helpful, and it blends well with bipolar-specific therapies, which emphasize regular daily routines. Many patients with recurrent depression endorse clear hypomanic states that are just short of the 4-day duration required in the DSM, and these short-duration hypomanias are included in DSM-5 as a “condition for further study.” They are particularly common in adolescents who go on to develop full bipolar disorder, but short-duration hypomania can persist throughout life, and studies suggest that such cases represent an “intermediate phenotype” between unipolar and bipolar. One study supports lamotrigine for these patients, and this agent seems particularly effective in patients with quick, brief mood swings (McCraw S and Parker G, J Psychopharmacol 2016;30(6):554–558). Antidepressants should be used with caution, though they are less risky here than they are in full bipolar disorder. In general, the more recent, more severe, and more frequent the manic symptoms, the greater the risks with antidepressants. As you use the Bipolarity Index, you will encounter patients who deny manic symptoms but have multiple signs of bipolarity. These patients usually have recurrent depression and score in the 40–60 range on the Bipolarity Index. This is likely a mixed group including: 1) true unipolar depression; 2) older patients, who have forgotten their manias (pure mania is more prominent in young adulthood); and 3) younger patients, who are at high risk of conversion to bipolar disorder (see next section). There is not a clear treatment for these patients, but there is a definite need to watch carefully (particularly with antidepressants) and gather more information. 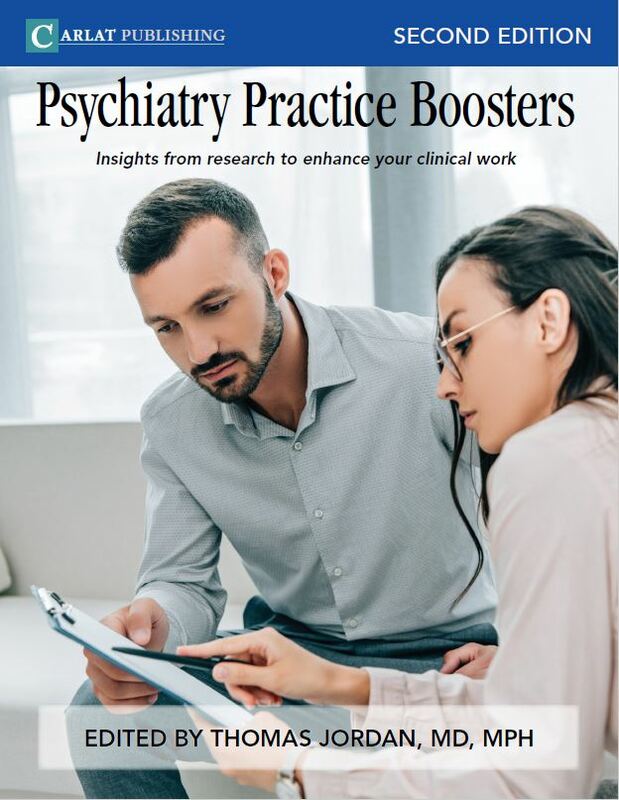 Outside of antidepressants, I look for treatments that work in both unipolar and bipolar depression (see Recommended Treatment Options table on page 3). Bipolar is a highly genetic illness, and research is starting to identify the early, prodromal signs of the disorder. Those at highest risk are patients under age 25 who present with significant psychiatric symptoms and have a first-degree relative with bipolar disorder. It is the severity of the presenting symptoms that indicates the risk, rather than the type, as prodromal bipolarity can present as anxiety, ADHD, substance abuse, and nonspecific behavioral problems. Family therapy, which aims to improve communication and reduce levels of expressed emotion, has the best research support and is a first-line recommendation in a new treatment algorithm for prodromal bipolar disorder. 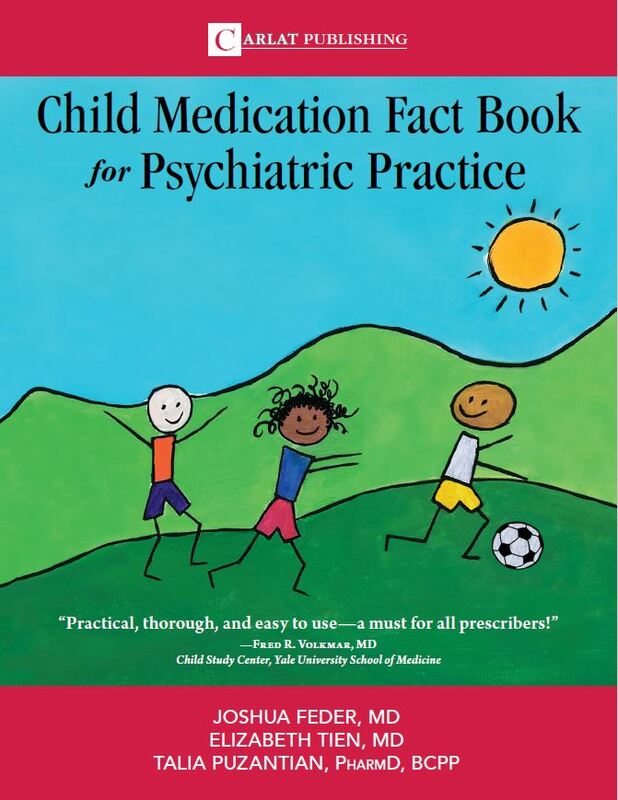 In that algorithm, medications are only used if symptoms interfere with functioning, and antidepressants are not allowed if subsyndromal manic symptoms are present (if they are, mood stabilizers are used). Studies also support omega-3 fatty acids in this group. TCPR Verdict: When evaluating depression, keep the bipolar spectrum in mind. Treatment informed by this approach might be more effective.